“A History of Russian Philosophy”, by V. V.
Kegan Paul Ltd., London, 1953, vol. I, pp. 109-111. Leo Tolstoy, N. Berdyaev and N.O. Lossky, among others. and add two footnotes with extra information on Labzin. 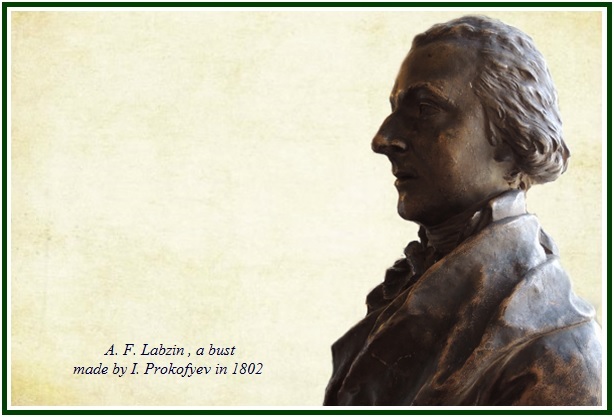 Aleksander F. Labzin (1766-1825) very early displayed outstanding talent, especially in mathematics (he studied higher mathematics to the end of his life). There is no definite evidence that Labzin was enthusiastic about Schwarz’s occult ideas, although Pypin, for example, considers Labzin a “continuer of Rosicrucianism in literature”. Labzin undertook the translation and publication of mystical books, such as Eckartshausen’s Key to the Mysteries of Nature, 1804, Vital Hieroglyphics for the Human Heart, 1803, etc. In 1806, he began to publish the Sionski vestnik [Zion’s Herald], which was an immediate and widespread success. A branch of the British Bible Society was formed in Russia, and a kind of “universal Christianity” was implanted from above. Criticism of Western sects was forbidden. The whole spiritual atmosphere of the time exhibited a triumph of “non-ecclesiastical Christianity”. This was strikingly represented by the Quakers, who had great success both with Alexander I and in the general religious movement of the time. In this atmosphere Labzin resumed publication of his Sionski vestnik, warmly developing the idea of “inner Christianity”, and calling upon Russians to “awake”. But this “awakening”, according to Labzin, required no “outward acts”; it is necessary, for the “perfection of the soul and of the whole man”, for “union with the heavenly world”, to combat the influence of the material world upon the soul. Magnetism, which frees the soul from the body, is, according to Labzin, the means for doing this. Labzin was resolutely opposed to creedal divisions; he even asserted that the faith of Christ “does not separate believers from nonbelievers” or “Old-Testament man from New”, that “Christianity existed from the creation of the world”, that “the Church of Christ is boundless, embracing the whole human race”. Labzin spoke of Holy Scripture as a “mute preceptor which points symbolically to the living teacher dwelling within the heart”. “The outer church is a crowd of public, inferior Christians, like Job on the dung-heap”. Labzin, in this preaching of non-ecclesiastical Christianity, which shows clear signs of a secularism verging on conflict with the Church, openly followed the Quakers. In his justificatory letter (when he decided, in view of the obstructions of censorship, to discontinue his journal) he wrote that his “models” were Boehme, Stilling, and Saint-Martin. These statements are an interesting revelation of Labzin’s closeness to the rationalistic tendencies of the time , as well as to the first germination of the theurgical conceptions, which sought in a knowledge of the “secrets of nature” – for example, magnetism, in which everyone was interested at the time – a key to higher revelations (outside the Church). Labzin’s life ended unhappily. He was exiled to a remote province – because of a sharp word concerning persons close to the Tsar. However, he found warm admirers there who made his last days easier. See in our associated websites the article “Slavophilism and Theosophy”, by Carlos Cardoso Aveline.